Interstate 310 is a mostly elevated freeway linking U.S. 90 at the unincorporated community of Boutte with I-10 and the New Orleans metropolitan area at Kenner. I-310 spans the Mississippi River between the St. Charles Parish communities of Luling and Destrehan across the Hale Boggs Memorial Bridge. The Hale Boggs Memorial Bridge opened in 1983 as a local link between Louisiana 18 at Luling and Louisiana 48 at Destrehan.3 Photo taken by Steve Hanudel (08/15/05). A study in 1969 outlined an outer belt freeway system in New Orleans between the Earhart and View Carre Expressways. It included adding a new uptown Mississippi River crossing via Earhart Boulevard at Napoleon Avenue. Interstate 310 was considered as a possible designation for both expressways. The Earhart Expressway was proposed to run east from Louisiana 49 (Williams Boulevard) near New Orleans International Airport (MSY) to the Pontchartrain Expressway along Earhart Boulevard. The Vieux Carre or Riverfront Expressway would have extended east through Downtown New Orleans to an elevated highway passing through the French Quarter along the Mississippi Riverfront. 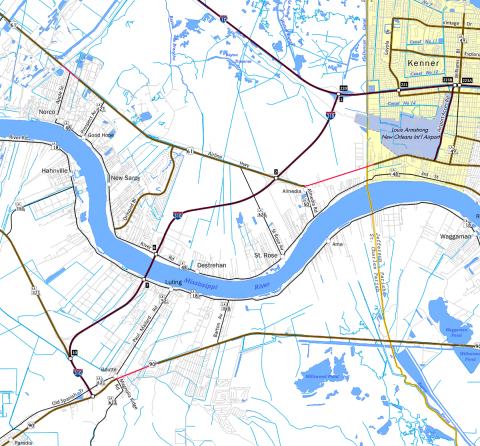 Following the cancellation of the Riverfront Expressway proposal, the Earhart Expressway was rescinded westward to the Jefferson Parish line. The limited access highway within Jefferson Parish was eventually constructed. However it was only partially constructed, as an interchange between the expressway and Causeway Boulevard was omitted and the western extension to Williams Boulevard was never built. Louisiana 3139 overlays the Earhart Expressway / Boulevard east from Louisiana 3154 (Dickory Drive) to Monroe Street in New Orleans. 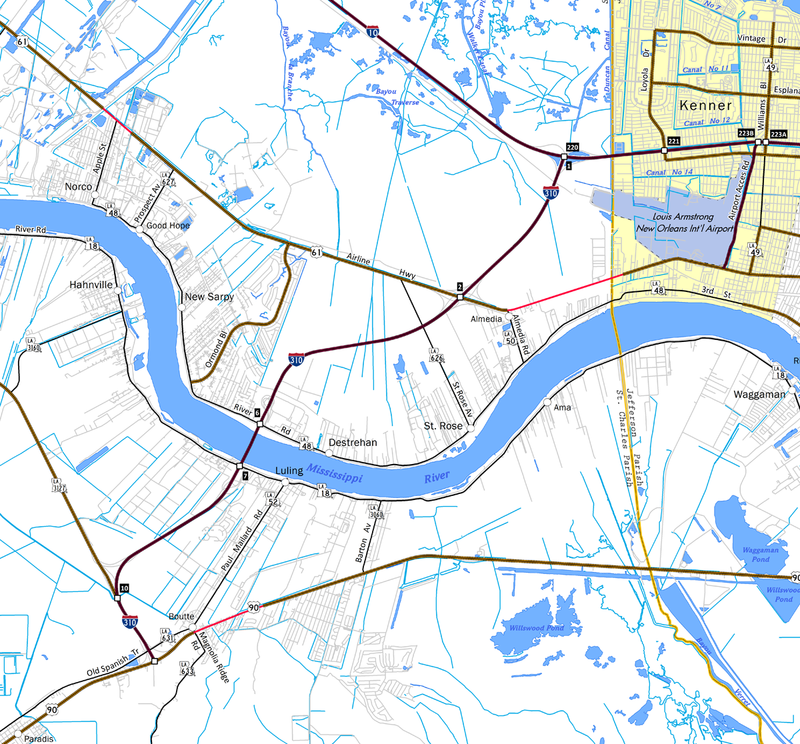 Along with Interstate 510, I-310 in St. Charles Parish was included in a plan for a greater outer belt freeway around the New Orleans metropolitan area. Numbered Interstate 410, this highway was deferred and subsequently canceled. However it reemerged in the “Louisiana Statewide Transportation Plan Update” issued in 2003 under an Interstate 510 project that would expand the Chalmette Bridge (LSTP-029). Connecting the I-310 and I-510 freeway spurs was considered by LADOTD as a possible solution to perennially clogged Interstate 10 between the airport and Downtown. Costing $297.1-million, work on the freeway between Boutte and I-10 by the Jefferson Parish line broke ground in 1976. AASHTO approved this route as Interstate 310 on July 6, 1977. A multi level systems interchange joins Interstate 310 with U.S. 61 (Airline Highway) at Exit 2. This exchange is almost completely elevated due to the Labranche Wetlands. Photo taken 05/09/15. Interstate 310 continues 2.25 miles north from U.S. 61 to conclude at I-10 (Exit 1). Photo taken 05/09/15. The city limits of New Orleans lie ten miles to the east along forthcoming I-10. The capital city of Baton Rouge is 57 to the northwest. Photo taken 05/09/15. Traffic partitions for Interstate 10 west ten miles to I-55 at LaPlace (Exit 1) and I-10 east through Kenner and Metairie (Exit 1A). Photo taken 05/09/15. Exit 221 leaves I-10 west for Loyola Drive in the city of Kenner. The freeway continues 1.25 miles to Interstate 310 in St. Charles Parish. Photo taken 05/09/15. Interstate 310 angles southwest from Exit 220 to connect I-10 with U.S. 90 for points southwest including Houma, Morgan City, and Raceland. The freeway spans the Mississippi River between Destrehan and Luling while also serving St. Charles Parish and communities such as Saint Rose and Boutte. Photo taken 05/09/15. Leading east from I-55 at LaPlace to Interstate 310, I-10 runs ten miles along an uninterrupted viaduct across the southwestern fringes of the Lake Pontchartrain, including the Bonnet Carre Spillway. Photo taken 10/22/03. Greenouts on Exit 220 overheads added Boutte to the original I-310 control city of Houma. Interstate 310 also provides an alternate route to Louis Armstrong New Orleans International Airport (MSY) via U.S. 61 (Airline Highway). Photo taken 10/22/03. Flyovers at the directional T interchange (Exit 220) come into view on the half mile approach for Interstate 310 south. Photo taken 10/22/03. The longest continuous viaduct extends southward from I-10 east along I-310 south. Interstate 10 returns to grade level through the city of Kenner. Photo taken by Jeff Royston (05/24/06). Louisiana 3127 (River Parishes Highway) joins Interstate 310 at a three-wye interchange (Exit 10) just north of the freeway end at Boutte. Photo taken 05/09/15. A pair of freeway ends signs stand at the LA 3127 entrance ramp. Photo taken 05/09/15. The I-310 mainline shifts onto the off-ramp for U.S. 90 at stub ends built into the freewya for the planned extension beyond Boutte. Photo taken 05/09/15. U.S. 90 travels southwest from I-310 to Raceland, Houma, Thibodaux and Morgan City. The highway upgrades to a freeway (Future I-49) in 14 miles. Photo taken 05/09/15. U.S. 90 approaches Interstate 310 & Louisiana 3127 north after intersecting Louisiana 52 north and 633 south in Boutte. Photo taken by Steve Hanudel (08/15/05). Westbound U.S. 90 reaches the half diamond interchange with Interstate 310 & Louisiana 3127 north to New Orleans International Airport (MSY) and Donaldsonville. Photo taken by Steve Hanudel (08/15/05). Approaching the south end of Interstate 310 and Louisiana 3127 on U.S. 90 eastbound. Louisiana 3127 branches northwest from I-310 nearby and travels 44 miles to the Ascension Parish seat of Donaldsonville. Photo taken by Jeff Royston (12/12/02). Advancing through the half diamond interchange with Interstate 310, U.S. 90 approaches the northbound ramp for Destrehan, Kenner and New Orleans. Photo taken 11/20/08. Interstate 310 angles northeast five miles from U.S. 90 to the Hale Boggs Bridge across the Mississippi River. U.S. 90 spans the Mississippi over the Huey P. Long Bridge in 16 miles. Photo taken 11/20/08. “Moses’ New Orleans.” Fred Robertson, http://www.robertsongovernor.org/moses.htm. this web site examined the impact of that report and the freeway plans on New Orleans. Tom Lewis, Divided Highways New York: Viking, 1997. ViewKeeper.Org: The Near Demise of the French Quarter. http://www.viewkeeper.org/artmap_i310.html included maps, diagrams, and photos showing the proposed route of the Vieux Carre Expressway from the 1950s and chronicled in the book, The Second Battle of New Orleans, most of which took place in the 1960s. “Scissors Snip Opens I-310 Pathway for St. Charles.” The Times-Picayune (New Orleans, LA), July 24, 1991. “Last Link of I-310 Completed.” The Times-Picayune (New Orleans, LA), May 8, 1993. “Sign Project for Interstate is Under Way.” The Times-Picayune (New Orleans, LA), October 28, 1993.